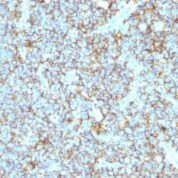 Anti-CD99 / MIC2 Antibody Clone 12E7. General Description of CD99 / MIC2. Recognizes a sialoglycoprotein of 27-32kDa, identified as CD99, or MIC2 gene product, or E2 antigen. MIC2 gene is located in the pseudo-autosomal region of the human X, Y chromosome. MIC2 gene encodes two distinct proteins, which are produced by alternative splicing of the CD99 gene transcript, are identified as bands of 30, 32kDa (p30/32).Although its function is not fully understood, CD99 is implicated in various cellular processes including homotypic aggregation of T cells, upregulation of T cell receptor, MHS molecules, apoptosis of immature thymocytes, leukocyte diapedesis.CD99 is expressed on the cell membrane of some lymphocytes, cortical thymocytes,, granulosa cells of the ovary. Most pancreatic islet cells, Sertoli cells of the testis,, some endothelial cells express this antigen. Mature granulocytes express very little or no CD99. 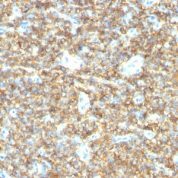 MIC2 is strongly expressed on Ewing s sarcoma cells, primitive peripheral neuroectodermal tumors. 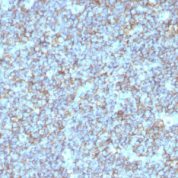 Anti-CD99 / MIC2 Antibody Clone: 12E7. Buffer and Stabilizer: Tissue culture supernatant with 0.05% Azide. Anti-CD99 antibody staining is expected to be primarily localized to the golgi apparatus. 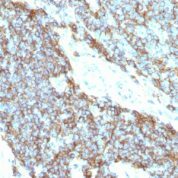 Variations in CD99 / MIC2 antibody staining intensity in immunohistochemistry on tissue sections are present across different anatomical locations. An intense signal was observed in cells in the endometrial stroma in endometrium, cells in the red pulp in spleen, cells in the seminiferous ducts in testis, glandular cells in the cervix, uterine and prostate, hematopoietic cells in the bone marrow, islets of Langerhans in pancreas, ovarian stroma cells in the ovary, respiratory epithelial cells in the nasopharynx and squamous epithelial cells in the esophagus. More moderate antibody staining intensity was present in cells in the endometrial stroma in endometrium, cells in the red pulp in spleen, cells in the seminiferous ducts in testis, glandular cells in the cervix, uterine and prostate, hematopoietic cells in the bone marrow, islets of Langerhans in pancreas, ovarian stroma cells in the ovary, respiratory epithelial cells in the nasopharynx and squamous epithelial cells in the esophagus. 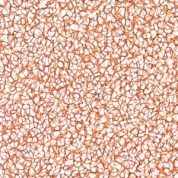 Low, but measureable presence of CD99 / MIC2 could be seen inadipocytes in mesenchymal tissue, cells in the white pulp in spleen, endothelial cells in the colon, follicle cells in the ovary, glandular cells in the breast, duodenum, endometrium, epididymis and gallbladder, macrophages in lung, non-germinal center cells in the tonsil and squamous epithelial cells in the tonsil. We were unable to detect CD99 / MIC2 in other tissues. Disease states, inflammation, and other physiological changes can have a substantial impact on antibody staining patterns. These measurements were all taken in tissues deemed normal or from patients without known disease. 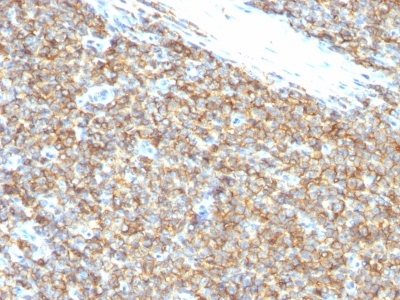 Tissues from cancer patients, for instance, have their own distinct pattern of CD99 / MIC2 expression as measured by anti-CD99 / MIC2 antibody immunohistochemical staining. The average level of expression by tumor is summarized in the table below. The variability row represents patient to patient variability in IHC staining. enQuire Bio's CD99 / MIC2 Anti-Human Monoclonal is available for Research Use Only. This antibody is guaranteed to work for a period of two years when properly stored. enQuire Bio » Antibody » Anti-CD99 / MIC2 Antibody Clone 12E7.